Provides Wi-Fi to multiple devices at once, at the same speed with Multi-User MIMO. Tri-Band Wi-Fi speeds up to 5.3 Gbps*. Access and control home Wi-Fi from anywhere with Smart Wi-Fi. Supercharge your work and play with Max-Stream. 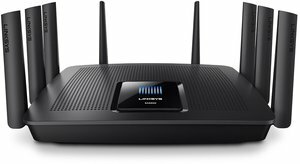 Reaching speeds up to AC5400, this wireless router keeps the whole household online. Next-Gen AC Wi-Fi for supercharged work & play. Enables your device to automatically switch to the strongest Wi-Fi signal as you move around your house when Max-Stream Routers are paired with Max-Stream Range Extenders. The MAX-STREAM AC5400 MU-MIMO Gigabit Wi-Fi Router (EA9500) offers Seamless Roaming as you move around your home when linked with a MAX-STREAM Range Extender. With Seamless Roaming, your enabled wireless devices will automatically switch to the strongest Wi-Fi signal, so you won't have to manually connect to the router or range extender when you move from one room to another--or even to your garden. This means that you can move freely throughout your home while video chatting or streaming videos without experiencing dropped calls or buffering. • Guest Access: Create a separate, password-protected Wi-Fi network for up to 50 guests and easily share the password. • Parental Controls: Ensure a safe Internet experience for your kids -- even when you're away from home. Restrict access to inappropriate or distracting content, control usage, and block specific devices from accessing the Internet. • Device Prioritization: You can prioritize devices that need the most speed.